Traditional ‘Chinese bread’ comes across very differently to typical Western bread. 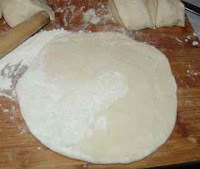 What is called in English Chinese bread can actually be two different things: one is steamed bread with raising flour; the other one is light fried bread with plain flour or raising flour. And these two types can also be distinguished by different fillings, different flour… all sorts. In Chinese term, most of the steamed ones are called bao , where most of the light fried ones are called bing , many are referred as Chinese flat bread. 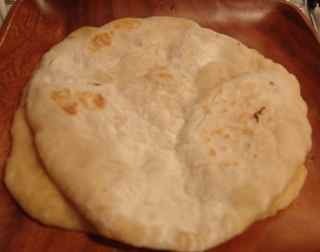 And different regions make different ‘bing’ (flat bread). When I was doing my data collection for my graduation work many years ago, we travelled from my city to Beijing, then from Beijing to Xi’an through centre China then to Sichuan by train, crossed a few different provinces and major cities. At every train stop, we would get off the train to buy some ‘Bing’ being sold on the platform — then we were poor students, having that with some vegetables and chilli paste was our main food. (Well, on the long journey on the train, there were not much we could buy of anyway.) But we were totally fascinated by how different those ‘bing’ (flat bread) could be just a few train stops away from each other. Eating different regional bread became an interesting thing. Nowadays, even with the regional food being introduced to every part of China, I still found hard to find the same ones as we ate on the train. I guess the sweet memories can never to overtaken…. if only there is a time tunnel. 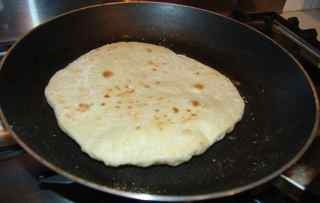 I have never been able to make those ‘bing/flat bread’, probably I know I will never be able to make the same taste, so I gave up. Anyway, this recipe is one of the “bing”, and is the most popular and simplest one in Northeast China. It is very similar to ‘Nann bread’, but it is lightly fried in a shallow sauce pan, and the shape is different, if I am not too wrong, most of bing is round shape. 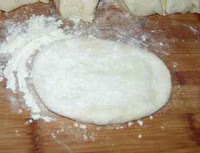 It is called ‘fa mian bing’, as in ‘raising flour bread’. 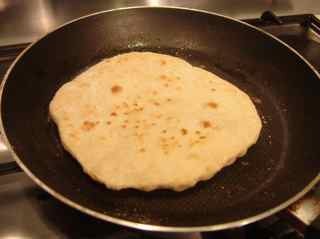 According to its name, you already know it is made from raised flour. 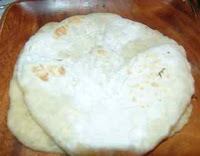 My mum used to make it often at home, I like it, well I like all kind of flour based food. It is too ‘homemade’ food, you cannot find in any restaurants or shops. I think I started learning to make it from mum was because my ‘homesick’? I just miss that when my mum made it, and we had it with soup, for example. Once, my mother-in-law and her sister (I call auntie) came to visit, this Bing was one of the dishes they really enjoyed (I am still in the process of learning authentic Spanish food). The whole process is very easy. It uses raising flour, so needless to say that raising up flour is the main part, sometimes I use self-raising flour instead of making the raising flour myself, it also works. Here it is how I do it the simplest way. I made for around 3 people’s portion for dinner, it served as stable food, so no rice on the table). 1) Mix four cups of plain flour with 1 and 1/4 cup of warm water, and 1 tablespoon of salt, and 1 teaspoon of fast baking yeast. 2) Kneading the dough well, and keep it in a warm location to raise for around 1 hour and half. 3) Divided the big dough into a few small ones, and roll the small doughs into a flat sheet but not very thin, say around 0.7cm. 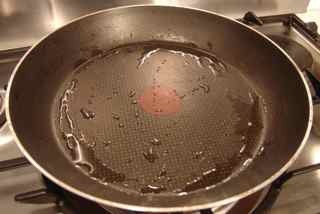 4) Heat the shallow sauce pan, and pour in a little bit oil, and make it evenly spread in the sauce pan. 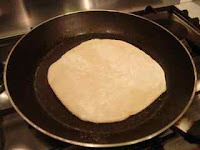 5) When the sauce pan is heated up, (very hot) place rolled sheet into the sauce pan. (If the sauce pan is not hot enough, the first side contacted the sauce pan would not inflate, so it would not be too soft). 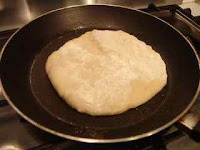 6) The bread would raise, like having bubbles :)) on the surface. 7) Then turn over on the other side, the bubbles would raise up as well. — Then it is done!! It is normally good to have with soup or .. something like ‘Jidan geng’ (Chinese steamed eggs) . Sometimes there would be some dry flour left in the sauce pan, if it is cumulated too much it could cause smoke, so you need to constantly clean the sauce pan.